Answer: You will need sport fishing licenses since you will be taking fish and not game. 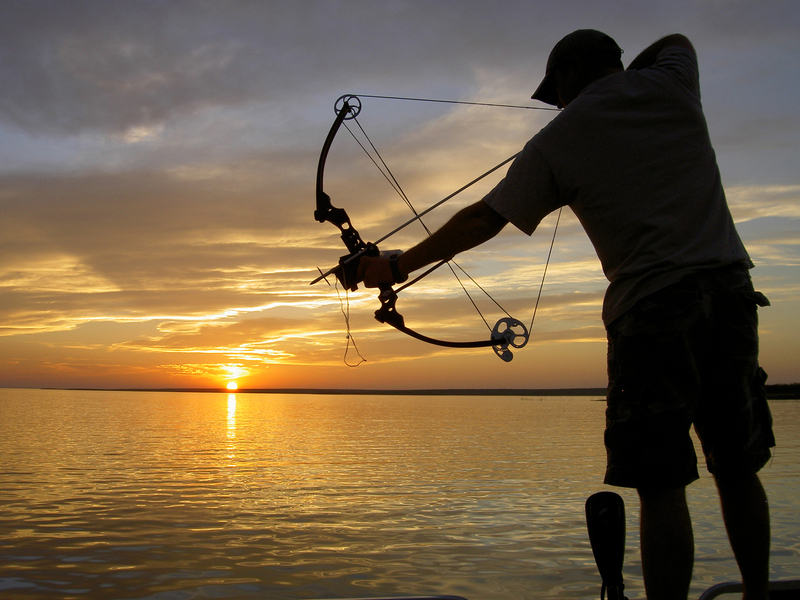 No special reels or gear are required for bowfishing but you must have the arrow shaft or the point, or both, attached by a line to the bow or to a fishing reel (includes crossbow) (California Code of Regulations, section 1.23). Be sure to check with the governing law enforcement agency for the area where you intend to fish because not all areas of the state (including various federal, state and local parks) are open to bowfishing. Some areas prohibit using this type of fishing gear because they consider it possibly a “deadly weapon.” This has been the case primarily in incorporated city areas. If fishing in freshwater, please read section 2.25 in the Freshwater Sport Fishing Regulations for the list of permitted species and any special water restrictions (CCR Title 14, section 2.25). Answer: When taking nongame mammals (like these ground squirrels) for depredation purposes, the landowner must be able to prove damage by the nongame mammal prior to the take. Damage must be proven in order to fall under the parameters of “take” without a license. In addition, the no license requirement only applies to the landowner and their agent. The person “taking” under depredation must show proof in writing they are acting as an agent for the landowner for depredation purposes and they must carry this proof while doing so. Shooting certain nongame mammals not causing damage may still be allowed by licensed hunters, but all hunters must have written permission of the landowner to hunt on private property. As always, remember that safe gun handling practices must always be practiced when using a firearm and other laws may apply. Range finding scopes on compound and crossbows? Answer: Scopes with laser rangefinders are not prohibited. Just be sure the device does not project any visible light or electronically intensify light for the purpose of either visibly enhancing an animal or providing a visible point of aim on an animal (CCR Title 14, section 353(i)). These devices may be used only for the take of nongame and furbearing mammals as provided in the Mammal Hunting Regulations (CCR Title 14, section 264.5). How many rounds of ammo are allowed for an AR-type gun? Answer: There are no restrictions on the number of rounds a rifle can hold while hunting. According to DFG Lt. Todd Tognazzini, rifles sold in California for the past several years are restricted to a 10-round capacity. This is due to other firearms laws created under the assault weapon ban. However, rifles owned prior to the capacity ban can still be used for hunting as long as ammunition is legal for the area being hunted.